Gov. Bill Haslam speaks during the Chattanooga Rotary Club meeting Thursday, Aug. 24, 2017, at the Chattanooga Convention Center in Chattanooga, Tenn. Haslam spoke about health care and education among other topics during the event. Tennessee Gov. Bill Haslam will urge the Trump administration to continue federal cost-sharing payments to health insurers to stabilize the health care market while Congress continues to debate health care reform. But Haslam, who next month will address a Senate health committee looking into rewriting the Affordable Care Act, said America's health care system is too expensive and the government needs to address the cost, not just the access to health care. 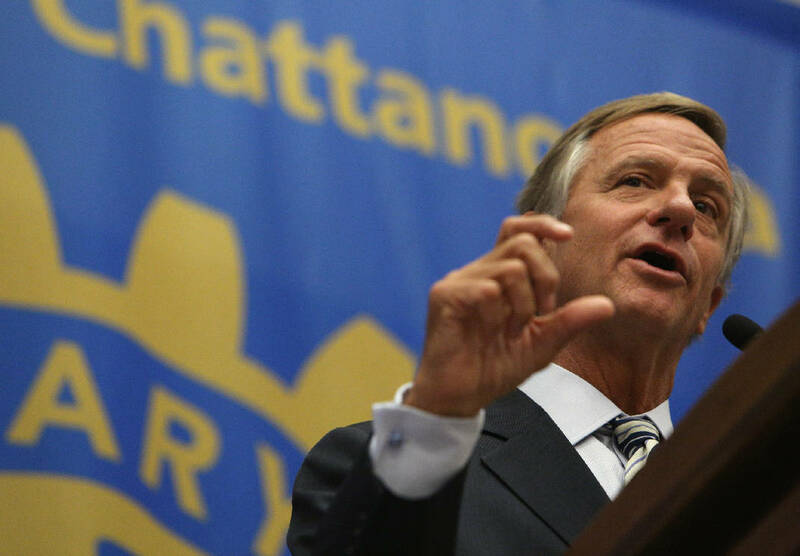 Haslam told the Rotary Club of Chattanooga on Thursday that states which must balance their budgets will be better able to control the soaring costs of Medicaid and other government health insurance than the federal government has been. Haslam suggested that Congress block grant money for Medicaid to the states with flexibility for local solutions. "I think that states could actually manage this better," he said. "If you force states and tell them, 'this is what you have and you must cover these individuals and get these kind of outcomes,' then you will see a lot of creative problem solving." The federal government, which continues to run budget deficits despite higher taxes to fund the Affordable Care Act, "is pushing the costs on to our grandchildren and that is why medical inflation is twice the rate of inflation of everything else," Haslam said. "If health care inflation keeps going as it is now, we're sunk as a nation," the governor said. "When Medicare and TennCare take more of the government's budget, there is less left for anything else. The federal government is about to become a really large health care insurance company with an army attached to it." The Republican governor said President Barack Obama focused only on coverage, not the cost, of the Affordable Care Act, and premiums have more than doubled for individuals in Tennessee over the past three years as a result. The Chattanooga-based BlueCross BlueShield of Tennessee, the state's largest health insurer, has asked state regulators for an average 21 percent increase in its individual rates for 2018. Cigna Healthcare, the state's second biggest health insurer, is asking for a 42.1 percent average increase in its individual plans under the Obamacare exchanges next year. BlueCross said it is making money this year from its individual plans offered on the Obamacare health exchanges for the first time in four years after increasing premiums by 62 percent in 2017 and 36 percent in 2016. But uncertainty over the future of Obamacare and even the promised federal cost sharing payments requires the insurers to ask for bigger premium increases to cover the extra risks. U.S. Sen. Lamar Alexander, R-Tenn., chairman of the Senate health committee, told the Tennessee Restaurant Association on Thursday that Congress needs to address the immediate health care crisis before trying to repeal Obamacare. "There are a number of issues with the American health care system, but if your house is on fire, you want to put out the fire," Alexander said. "In this case, the fire is in the individual market, where 350,000 Tennesseans and millions of others across the country — these are songwriters, farmers, the self-employed — face the real prospect of having zero options to buy insurance in 2018 and 2019 or, if they do have insurance to purchase, they may find premiums and deductibles might have gone up so high it's like they don't even have insurance because they can't afford to use it." After the GOP-controlled Senate failed to muster the votes to repeal and replace Obamacare this summer, Alexander said he is now working with Republicans and Democrats "to find a short-term solution for stabilizing the individual market" for 18 million Americans. Alexander has invited Haslam, Tennessee Insurance Commissioner Julie McPeak and four other governors to a Senate health committee hearing on Sept. 7 on identify short-term fixes to ensure health care is accessible and affordable for individual coverage in 2018. President Donald Trump, a persistent critic and opponent of Obamacare, could drop some of the enforcement of the individual and employer mandate for health insurance coverage and has also threatened to suspend some of the payments to insurers participating in health exchange markets. Insurers rely on the cost sharing subsidies, estimated to cost the federal government $7 billion this year, to reduce out-of-picket costs for low-income Obamacare customers. The Kaiser Family Foundation estimates that eliminating the subsidies would increase premiums by an average of about 20 percent. Haslam said the cost sharing reduction (CSR) payments are necessary to compensate insurers for the lack of premiums and deductibles for low-income patients. Without such payments, many more insurers could withdraw coverage and the cost of individual health insurance for those able to get coverage could skyrocket even more than it already has, Haslam said. "I think the CSRs are a good idea, because we have to do something to bring predictability into the insurance market so that you will not see premiums skyrocket," he said. "But we can't keep saying that the answer to health care is to just keep putting more money into it. That's the only path we've gone down for the past several years." To cut costs, Haslam said Medicare should be able to negotiate for lower drug prices and states should be given the flexibility for lower cost, local solutions. Haslam said Tennessee previously was the only state to exclude Medicaid coverage for Xanus, Valium and other benzodiozepines "and when we did that people found better, cheaper alternatives and there was not a negative consequence." But the Affordable Care Act, in a measure Haslam laughingly called "the Tennessee clause," required that Medicaid and the health care exchanges restore such coverage. "That ended up costing us more money," Haslam said.